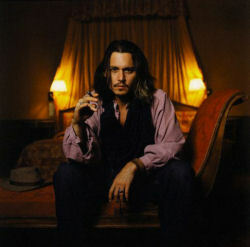 After the massive success of Pirates of the Caribbean, Johnny’s back with his new picture Secret Window. Paul Sheehan digs deep to fathom out this unpredictable rock ‘n’ roll actor. 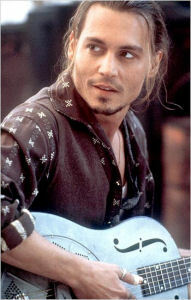 It is hard to believe that boyishly handsome Johnny Depp has been acting in films for two decades. After an inauspicious debut in the slasher flick A Nightmare on Elm Street he took a detour into TV for four years to star in the teen cop show 21 Jump Street. But since 1990 and his first film with director Tim Burton—the hauntingly beautiful Edward Scissorhands—Johnny has carved out a niche as the best-looking character actor around. He said no to some of the top leading men’s roles going (including Legends of the Fall and Speed) in favour of quirky roles in offbeat movies such as Ed Wood and Before Night Falls. 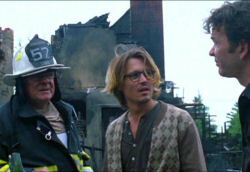 So, will his new movie Secret Window keep him on the list? In this taut thriller, Depp is best-selling mystery novelist Mort Rainey, desperately trying to finish his latest book. Stuck for an ending, the author hides away in a lonely cabin in the woods (never a good idea in these kind of movies), only to find himself confronted by his imagination and then by a stranger, John Shooter (John Turturro), who accuses him of plagiarism. That’s when the fun begins. At 5’10”, with sandy brown hair that goes every which way and soulful brown eyes, Johnny was recently named ‘Sexiest Man Alive’ by People magazine. His reaction to the title? “As soon as you turn 30, you go: ‘Oh no! 40’s next!’ But by the time you reach 40, you think, ‘This isn’t so bad’.” Getting older may make it easier for Johnny to be taken seriously as an actor in spite of his movie star good looks. Johnny grew up fast, the youngest of four children, in a working-class family in rural Kentucky. His beloved grandfather died when he was seven and, within a year, Johnny’s father had uprooted the family as he searched for a job. They spent months living in motels before settling in Florida. Johnny admits he started smoking when he was twelve and by time he was thirteen he was drinking, doing drugs, and spiraling downwards, indulging in petty theft and vandalism. Music was his salvation. He had always loved the gospel music at his uncle’s church and taught himself how to play the guitar. When Johnny was fifteen, he joined a punk rock band, The Flame, which played local nightclubs. As the band improved, they changed their name to The Kids, opened for hot groups such as Talking Heads and the B-52’s, and then decided to try their luck in LA. At twenty-five, Johnny found himself married to make-up artist Lori Anne Allison (a much more mature twenty-five), who suggested he try acting and introduced him to her friend, Nicolas Cage. [Editor's note—It was Cage that suggested Johnny try acting.] This led to that fateful audition for Wes Craven’s newest horror flick. When the band split up, Johnny got serious about acting and enrolled in drama school. He was soon cast in Oliver Stone’s Oscar-winning Vietnam epic Platoon, which led to the lead in 21 Jump Street as a young cop working undercover. He took the job thinking it would last less than a season and was shocked when he became the latest teen idol. He was delighted to spoof this image in his first real film role, John Waters’ offbeat comedy Cry-Baby: “My part was only three pages long but I felt I had to take it”. In 1990, he met his mentor, Tim Burton, and gave a heartbreaking performance as Edward Scissorhands. He fell for co-star Winona Ryder (having already romanced Twin Peaks siren Sherilyn Fenn and Dirty Dancing Jennifer Grey after his divorce). To declare his love, he had ‘Winona Forever’ tattooed on his arm; after their tumultuous break-up in 1993, he made that infamous alteration to ‘Wino Forever’. He was all too often brawling with the paparazzi and his bad boy reputation grew worse when River Phoenix died of an overdose outside of Johnny’s LA hot spot, The Viper Room, in 1993. “It was a nightmare. It still is a nightmare I’ll never recover from. It could have been so beautiful—he showed up with his guitar on his shoulder and his girlfriend by his side—it was such a waste what happened. River was a beautiful, talented actor who had all it takes.” Soon after, Johnny began a tempestuous four-year affair with supermodel Kate Moss. Through all these high times, Johnny continued to work steadily, reuniting with Tim Burton for Ed Wood, an affectionate homage to the world’s worst film director, and holding his own against Marlon Brando in the charming Don Juan DeMarco, and Al Pacino in the gritty Mafia crime drama Donnie Brasco. Then, in 1997, he surprised Hollywood by directing, co-writing, and starring in the intense drama The Brave. He delivers a great performance as an alcoholic Native American ex-con, who decides to die in a snuff movie in order to provide for his family. Though the film was a flop in the States, it was nominated for the top prize at the prestigious Cannes Film Festival. His reunion with Terry Gilliam went less well. The ill-fated The Man Who Killed Don Quixote imploded during shooting (all wonderfully captured in the fascinating documentary Lost in La Mancha), but any damage to Depp’s career was soon erased with the success of Pirates. With Geoffrey Rush as the pirate Barbossa, Orlando Bloom and Keira Knightley as would-be lovers, and Johnny as renegade Captain Jack Sparrow, the movie was the hit of the year. However, with the surprise success of Pirates, Johnny found himself being used in classic Hollywood fashion. Even though he had only a small role in Once Upon A Time in Mexico, it was suddenly marketed as his next big film: “That was very strange and very uncomfortable, but not surprising.” But being at the top of the heap (this week anyway) gives Johnny power he has never had. “It’s difficult for me to approach it from the angle of a businessman. I just to do what I’m hired to do, what I feel is right for the character. But, it would be great to make this whole slew of pet projects. Maybe this is the time to submit those projects. There’s a lot of stuff that I would love to get made that I’m not even right for as an actor—stuff that would be great to get made that don’t need me in them.” So, could it be that his next role is Johnny the producer? Don’t worry, we’ll be seeing a lot of Depp on-screen in the years to come. He has already finished Neverland, playing author J.M. Barrie (of Peter Pan fame) alongside Kate Winslet and Dustin Hoffman. And he is to pair up again with Tim Burton as the title character in Charlie and the Chocolate Factory. Then he takes on the acting challenge of a lifetime—the one that may well bring him back to the red carpet—in the adaptation of Jean-Dominique Bauby’s memoir, The Diving Bell and the Butterfly, about the near fatal stroke that left Bauby completely paralysed except for his left eye. Secret Window is out now at all major cinemas. Born: John Christopher Depp II on June 9th, 1963 in Owensboro, Kentucky—the self-proclaimed ‘barbecue capital of the world’. Parents: John Senior was a city engineer, and mother Betty Sue, a waitress. Johnny is very close to his mother, and with his first success he bought her a house. Siblings: All older: Debbie, Christi, (Johnny’s manager), and Danny (now known as DP, a screenwriter). Hidden Talents: Lead guitarist and singer in punk bands Flame and The Kids. Wrote his own theme music for 2003’s Once Upon A Time In Mexico. Tattoos: An even dozen including: his first, an Indian chief on his right bicep; his most infamous, ‘Winona Forever’ (dropped the ‘na’ after he and Ryder split up) on his left arm; and his favourites, ‘Betty Sue’ (for his mom) and one for each of his children on his right one. Inauspicious Debut: Killed by a bed (yes, a bed) in Nightmare on Elm St.
Rap Sheet: Arrested in 1989 in Vancouver for fighting with hotel security; in 1996 in New York City for trashing a hotel room; and in 1999 in London for scrapping with the paparazzi. Should Have Said Yes: Speed (which made Keanu Reeves a star), the Brad Pitt part in Legends Of The Fall, and the role of LeStat in Interview With The Vampire (taken by Tom Cruise). Should Have Said No: The Astronaut’s Wife, a sci-fi misfire that not even Charlize Theron could save; Arizona Dreams, a would-be offbeat comedy with Jerry Lewis doing his shtick; and The Ninth Gate, a thrill-less thriller (though if he was not in Paris to make this mess he would not have met Vanessa). Johnny first discovered his love for music as a boy in Owensboro, Kentucky. He would go to hear his uncle preach the gospel at his fundamentalist church and the spirit of the music overwhelmed him. As a troubled teen, he took solace in his room teaching himself on the guitar his mother bought for $25. After trying out for various bands, Johnny joined punk rock group, The Flame. Only fifteen, the still underage guitarist had to sneak into their gigs and would often have to leave after the first set. Making $25 a night for these appearances seemed good enough, but the band got better, changed their name to The Kids and started opening for prominent acts like Talking Heads and B-52’s. Johnny still laughs when he recalls swearing at punk icon Iggy Pop, who responded by calling him “a little turd” and then ignoring him. 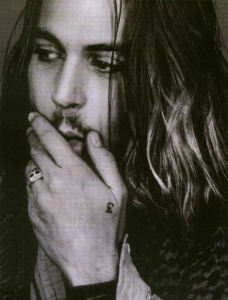 Pleased with is musical success, Johnny dropped out of high school at sixteen to concentrate on his music. The next year, The Kids decided to try LA, but without much luck. Since becoming a big-time movie star, Johnny has appeared in music videos for friends as varied as MacGowan (That Woman’s Got Me Drinking), The Lemonheads (It’s A Shame About Ray), and Tom Petty (Into The Great Wide Open). He also plays guitar and sings in a pickup band, P, which released an album in 1995. In 1998, he stepped in for the ailing lead guitarist for British band Oasis and played slide guitar on the hit single Fade In Out. With fellow Hollywood bad boys Keanu Reeves and Brad Pitt, he appeared on the Hollywood Goes Wild CD in support of animal rescue efforts. 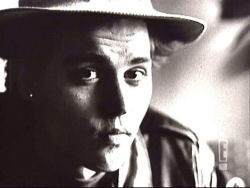 Most recently, Depp has directed Vanessa Paradis, his love and one of France’s leading musical lights, in several music videos to great acclaim and he played “a few chords” on her hit album.